After the deaths of Palestinians in Gaza, many questions remain of how these protests are organized and the how they unfolded. 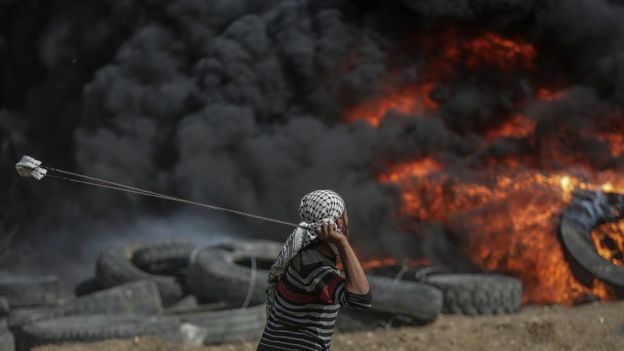 Several weeks ago, Hamas organized a “March of Return” – weekly riots at the Israel-Gaza border leading up to May 15, Nakba (catastrophe) Day, which also marks the day Israel declared independence in 1948. The goal of these riots is to establish the “right of return” concept, a claim that Palestinian refugees of the 1948 War should return to Israeli territory, which would make the Jewish population the minority, and end the two-state solution. On Monday, May 14, the U.S. officially recognized Jerusalem as the capital of Israel as the new U.S. embassy opened there. This sparked controversy worldwide but was not the reason for the protests on the Gaza border. Hamas, a terrorist organization which violently took control of Gaza in 2007, fuels these protests. The protests have been organized around five different locations along Israel’s security fence. Over the past eight weeks, the protesters have used different tactics and methods to attempt to breach the Israeli fence which holds as a barrier between Gaza and Israel. For example, protesters began lighting massive fires with burning tires along the border. Israel’s main fear during these riots is that hundreds of Palestinians, including Hamas members, will break through the Gaza security fence and wreak havoc in one of the Israeli communities by attacking residents, starting fires and destroying buildings in order to stimulate the “right of return.” Hamas has released maps indicating the shortest distances between Gaza and these Israeli communities. The mass amounts of people who approach the fence are generally made up of young men. The goal of the protestors is to get close enough to the fence so that they can cut through it with wire cutters. Most protesters do not make it this far, but some do. Hamas advises those who stay back in Gaza to light kites on fire and fly them into Israel to set neighboring fields and homes aflame. More importantly, Hamas has instructed its thousands of terrorists to blend in with civilians in order to use them as human shields. This ensures that Hamas’ terrorist objectives are put forward and enacted. Israel has continuously warned that they would do whatever steps necessary in order to protect its citizens. Protesters who approach the fence would be met with retaliation and defense tactics. Israel has been under fire for their use of force against the “peaceful” Palestinian protests, and although the death of civilians are not justified, Hamas prioritizes their own terrorist agendas over the well-being of Palestinians living in Gaza. As a result of Hamas’ neglect for its citizens, and insistence on terror, civilians are suffering for the actions of a terrorist organization. Nikki Haley, the U.S. ambassador to the United Nation, applauded Israeli forces for what she called their “restraint” in the face of protests in Gaza. She said it was Hamas – not Israel – that was putting the lives of civilians in harm’s way. The director of Gaza’s Shifa Hospital’s emergency department, Ayman Al-Sahabani, said that medical supplies were running out in the Gaza strip. “We are talking about 25 times the capacity of the emergency department, with all the big challenges and the shortage of medicine and medical supplies that have reached critical levels… A lot of these patients are waiting their turn to enter the operating rooms,” he said. Even though Gaza’s 13 public hospitals and 14 NGO-run clinics are on the verge of collapse, Hamas turned away two truckloads of Israeli humanitarian aid intended to relieve medical shortages in the Gaza strip on Tuesday, May 15. As a result, it is evident that Hamas prioritizes their own violent agenda before the wellbeing of their civilians. The transfer was facilitated by the IDF in coordination with the Coordinator of Government Activities in the Territories and the Gaza District Coordination and Liaison office. According to Israel, the IDF shipments included IV fluids, bandages, pediatric equipment and disinfectants, as well as fuel for hospital generators. Hamas encouraged Palestinian rioters to damage sections of the Kerem Shalom crossing – the only goods crossing into the Gaza Strip – disrupting the transfer of diesel fuel and building materials into Gaza. Hamas’ intent is to portray these protests as peaceful demonstrations to the outside world and to the media. Israel is being forced to respond with force to dangerous, violent and illegal activities being catalyzed by Hamas with one simple goal: to destroy Israel and reinstate their “right of return.” When the international community legitimizes Hamas’ tactics by painting Israel’s response as a violent crackdown on human rights, it pushes Israel into a defense corner and the idea of peace begins to fade away. I wrote a very similar article for my school newspaper! This is super informative and very well done, especially with the plethora of news articles spread with biased opinions.